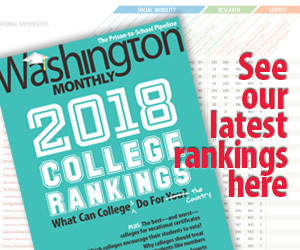 Washington Monthly | Worst. Argument. Ever. The point, of course, was to point out something of a global consensus on the issue. There are certain basic employee benefits that should be available, and as the argument goes, if 163 countries already offer paid family leave, maybe it’s time for the United States to step up. In response, Rep. Darrell Issa (R-Calif.), easily one of Congress’ most embarrassing members, produced a video attacking the proposal. Chris Harris notes one of the video’s key arguments. Immediately following Congresswoman Maloney’s remarks, the video features text asking: “Could these guys be wrong on paid parental leave?” The video then features NORTH KOREA, IRAN, VENEZUELA, and CUBA, with each country’s name accompanied by a photo of its respective dictator. Is [Issa] serious? Is his best argument actually that four countries the U.S. doesn’t like “recognize the importance” of newborn children having their parents at home to care for them? That we should refuse to help dedicated public servants because Mahmoud Ahmadinejad and Hugo Chavez do the same? Apparently, yes, that’s Issa’s argument. I’ll concede that Maloney’s line of reasoning is flawed. The international popularity of a policy does not necessarily lend merit to the idea. But Issa’s response is among the dumbest things I’ve ever heard. Paid family leave is necessarily dubious, he argues, because families who live under some authoritarian regimes already enjoy the benefit. By this logic, every law or social benefit offers the U.S. a template for what not to do. Cuba has public schools? Then public schools are bad. Iran has public parks? Then we should do away with our park system. It’s the kind of ridiculously lazy argument one might expect from a child. A slow, confused child. Remember, Issa isn’t just some anonymous back-bencher — House Republicans made him the #1 GOP lawmaker on the House Committee on Oversight and Government Reform. Seriously.